This work is a triumph of engagement through interface because it integrates the structure of a platformer video game and uses it to shape a poem into an irresistibly forward-moving experience. The visuals are compelling and fun, simultaneously combining youthful enthusiasm with adult concerns and thought processes on a variety of themes. The poetic lines vary in style, imitating biblical passages, apartment ads, various line arrangements. 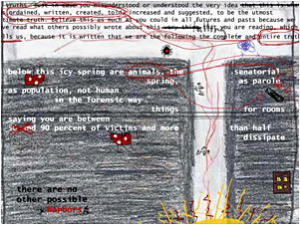 The handwritten scribbles and text offer alternative readings and word combinations. What holds everything together is the underlying dialectic of childhood and adulthood, as seen in the drawings, videos, text, and the structure of the game, which makes us want to discover every little piece and continue going deeper into the experience Nelson has crafted for us.